Dr. John Hendricks, chair and professor of Stephen F. Austin State University's Department of Mass Communication, second from left, presented research in Madrid, Spain, during the 13th annual Global Communication Association Conference. Hendricks presented research at two other international conferences in Athens, Greece and Prague, Czech Republic. NACOGDOCHES, Texas - Dr. John Hendricks, chair and professor of the Stephen F. Austin State University Department of Mass Communication, recently attended and presented research to international media scholars in Europe at three conferences. Hendricks attended the 16th annual International Conference on Communication and Mass Media held in Athens, Greece, where he presented "Social Media Strategies and Platforms in 2016: The Trump and Clinton Campaigns." More than 80 scholars from 20 countries attended and presented 61 research papers. The mission of the conference, organized by the Athens Institute for Education and Research, was to become a forum where academics and researchers from all over the world could meet, exchange ideas on their research, discuss future developments in their disciplines and engage with professionals from other fields. Hendricks then traveled to Madrid, Spain, where he presented "Trump vs. Clinton: Social Media Usage and the 2016 Presidential Campaign," at the 13th annual Global Communication Association Conference. The objective of the GCA conference was to explore contemporary global issues in the media industry. 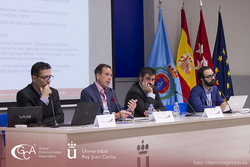 Rey Juan Carlos University hosted the Madrid conference. Scholars from more than 20 countries attended and presented more than 70 research papers. On the final stop of the European journey, Hendricks attended the International Communication Association's 68th annual conference in Prague, Czech Republic. While there, he participated in professional development sessions, interacted with scholars from around the globe and learned about new research. The ICA strives to advance the scholarly study of human communication by encouraging and facilitating excellence in academic research worldwide. "Having the opportunity to interact with scholars from around the world who study what I study was invaluable and very interesting," Hendricks said. "At each of the conferences, I was able to learn firsthand about pioneering and innovative research being conducted at other universities around the world." To learn more about Hendricks' presentations, contact him at hendricksj@sfasu.edu or (936) 468-4001.